Listen to this track by Bentonia, Mississippi guitarist, pianist, and all-around legendary bluesman Skip James. It’s “Hard Time Killin’ Floor Blues”, a sepia-toned treasure from the age of delta country blues that would be featured on James’ 1966 album Today! The song would be sourced from his repertoire that appeared many years before in 1931 with his initial recordings on the Paramount label. During that era, Skip James’ career as a full-time musician and songwriter would be scuppered by the Great Depression. When most of your audience doesn’t have a job, it’s hard for them to buy records. So, after recording his Paramount sides, he slipped back into obscurity. This economic reality had impact on many, including Mississippi John Hurt and Son House, among others. But, like those two other musicians, Skip James would enjoy a second wind in the 1960s, thanks to a bona fide hero’s quest to find the grail of true American culture. By the early sixties, the folk-boom was in full effect. Adherents to that scene were very serious about finding the true voices of American culture, which many of them sought in the American folk traditions of the 1930s. In some ways, this was in revolt against modern R&B and rock ‘n’ roll, often looked upon by folk purists as being second rate, or culturally empty. 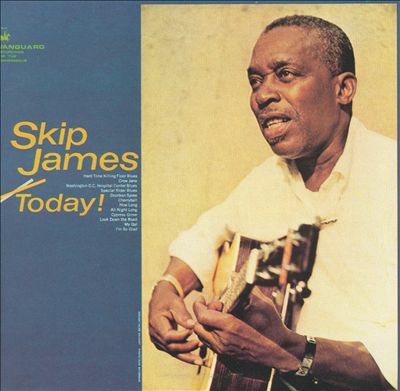 Skip James was among those older sought-after voices of authenticity, with a distinctive sound of his own and coming from an era that seemed to be shrouded in mystery. Skip James himself learned his craft at the feet of another bluesman, Henry Stuckey, who would remain unrecorded. This was in the 1920s when the idea of recorded and mass produced pressings was still a pretty new idea, and when “race records” represented an emerging market for black record-buyers. Despite this new era of mass produced recorded sound and the commercial potential in which it dealt, the blues remained to be a venerable form. Its proponents stretched back for countless years having handed down the traditions largely from voice, instrument, and footstomp directly to the ears of their audiences and peers. That sense of mystery about the origins of the blues endures, with the knowledge that we are only aware of the masters of the craft who were recorded, with many of the same who weren’t recorded now lost to time. At the time perhaps, not much thought was given to the idea of historical posterity to extend beyond regions. In a time of Jim Crow America, cultural curation outside of the participants who passed the music to other players couldn’t have been too much of a priority. This wasn’t the case by the sixties, when (mostly white) college kids turned their scholarly minds to seeking the voices of the past in order to inform their future as the perceptions of mainstream culture were beginning to shift. These young and educated blues aficionados not only sought the obscure recordings made by those of Skip James’ vintage. They sought the men and women themselves, going down to the south in search of the names which appeared on the records that had made the rounds between folk singers and folk music collectors. This fervour for authenticity was how Skip James enjoyed his second wind, rediscovered by young blues fans looking for what they considered to be the real voices of American folk culture. This eventually led him to the folk music circuits, including an appearance at the Newport Folk Festival in 1964. It also led him into the recording studio to re-record his repertoire, and even lay down some new music, too. This song was one of the highlights, as was the Today! album as a whole, known as one of the best releases of the rediscovery blues era. Part of the reason for the accolades was that Skip James is completely undiminished on this release after being lost to time as a musician. His voice is still a ghostly and keening falsetto that sends chills up the spine, full of anguish and dread. His prowess with open D-minor tuning guitar is undeniable, with his lines on the instrument being pristine, and serving as vital counterpoint to his vocals. As modern and clean as the recording sounds, which is a good thing of course, the risk was that the ragged and primitive beauty of the original 78 rpm recordings might be lost. It’s not. In fact, it turns out that the sepia-toned world of dusty delta blues one can hear on those old recordings is not down to the age of the tapes or the vintage of the recording techniques. It all stems from the man himself. Skip James during his 1930s heyday. During this period, he would take on the roles of part-time musician, sharecropper, labourer, preacher, and bootlegger, among many others. As it turns out, the authentic American voice that folk-boomers were looking for in this case deals in some pretty shadowy themes that delve into the deepest reaches of the human heart. If the blues had morphed into a form that seemed pretty easy for beat combos to imitate by the sixties, with “Hard Time Killin’ Floor Blues”, it takes a turn into a dark and skeletal sonic territory, full of odd angles and unexpected turns. The melody seems less like an organized structure of three-chords-three-lines, and becomes something other, more like a cloud of smoke that suggests a form, but refuses to resolve into any one shape. Yet, it is cohesive, with an undeniable presence as you listen, full as it is of darkly conceived nuance. This was what the blues had been at one time; a musical form that dealt in the primal, the fearful, and (that word again) the mysterious. It is full of struggle, chaos, and existential angst. You know that people are driftin’/Goin’ do’ to do’/But they can’t find no heaven/I don’t care where they go. The words are a powerful evocation of the plight of the poor during The Great Depression, and of humanity’s spiritual hunger and desolation all at once. But it is the sound of the whole, that of a sad heart speaking in a language all of its own, that makes it such a haunting piece of work. The song may not stick in your head like a pop song does. But, the feelings it stirs up tend to linger. That was Skip James’ stock-in-trade. From the time of his rediscovery, Skip James had a prolific five years of recording before his death of cancer in 1969. Among his achievements was his impact on rock musicians who eventually covered his work, including Cream who’s take on James’ “I’m So Glad” would be one of their most high profile covers, and in turn help pay Skip James’ hospital bills as his cancer became more and more serious. Even if the folk purist crowd that had allowed him a second chance at being a full-time musician, his music could not be preserved in amber as tied to a simpler, purer age as they perhaps intended. Skip James’ art was bigger than that all along. To get the full story on how Skip James was rediscovered, have a read of this article that describes the bluesman’s soujourn from his Mississippi home to Washington D.C, initiated by young blues fan and musician John Fahey. It also lays out a fascinating history of this rediscovery period in American musical history in general. Great to hear/read a ‘roots’ music article, Rob. Thanks. There were quite a few 60s recordings made as part of the ‘re-discovery’ you describe, weren’t there? What they lacked in authenticity they made up for by adding richly to the library of recorded music. I think the search for authenticity was a good motivator in this specific instance. But, that goal of looking for art that is “pure” is misguided I think. Authenticity and art are hard to define at the best of times. The only measure of its worth is whether or not the results resonate with listeners. Luckily, the results with Skip James, Son House, Mississippi John Hurt were pretty great. Their work during the re-discovery period didn’t simply raise the profile of the blues. It informed other artists of other strains of music too to make great music of their own, very often referencing those voices, but ultimately becoming a better versions of themselves as artists. Really, that’s the only authenticity that matters in the end. I say, God Bless Chris Strachwitz and Arhoolie Records for a good bit of rediscovery and exposure through the ’60’s, ’70’s and beyond. I saw Bongo Joe in the Alamo Plaza in 1969, thinking he was just some local eccentric geezer with good rhythm. A year or two later there was his Arhoolie LP featured for a week or so in the window in Sam’s in Toronto! Being a bit skint in those days, I failed to acquire but in the early ’90’s I found it again in a great used vinyl emporium in Halifax.